Pears are a wonderful, juicy Fall fruit. The Pacific Northwest produces about 80% of the fresh pears in the USA. Harvest begins in August and continues with different varieties through September and October. Pears are actually harvested before they are fully ripe to avoid a gritty texture. You can find a lot of great info about pears, including recipes at USA Pears - they even have a blog! I have a yummy pear recipe to share with you today! My brother-in-law got this recipe from a coworker a few years ago and knew that I would like it! It makes a nice big pan of dessert with plenty to share. Lightly spray pan with cooking spray. Mix crust ingredients and press lightly to bottom of 11x13 pan. Bake 15-18 minutes at 350 degrees F.
Cool crust slightly. Beat filling until smooth and pour over crust. Core and peel 5-6 fresh pears or drain 2 large cans of bartlett pear halves. Slice pears as thinly as desired. Cover cream cheese with pear slices. Sprinkle with mixture of 2 tablespoons sugar and 2 teaspoons cinnamon. Bake at 375 degrees F for 20 minutes. Recipe can be halved and baked in 9x9 pan. 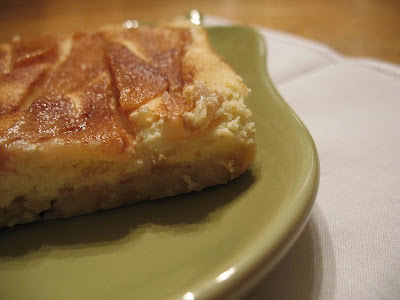 You should try this recipe - very yummy! I have made it with canned pears and with fresh. Of course the flavor is better with the fresh pears! How about a giveaway now? A pear-themed giveaway! 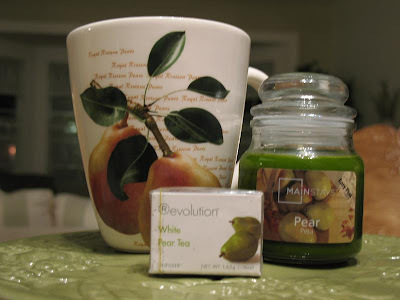 This giveaway is for a Harry & David pear mug, a Revolution white pear tea diffuser bag, and a little pear-scented candle. I wanted to give you a few moments to stop and smell the pears! **Giveaway Closed** Enter the giveaway by leaving a comment on this post! That's it! The giveaway will stay open through 10pm PST on Sunday 10/18 and the winner will be randomly chosen from the comments. Now it's time for you to link up your pear posts and recipes so we can all have more pear fun! You can link up a new or old post about pears, but please do include a link back to this post so everybody can enjoy the Fall Fruits Festival! If you don't have a blog, feel free to share pear links and recipes in the comments. Are you enjoying the Festival so far? Be sure to check back for pear posts. Tomorrow is all about Pumpkin, so get your pumpkin posts ready and come on back! I would really appreciate it if you help spread the word about the Fall Fruits Festival s**o we can get even more posts and recipes linked up! I'm linking this up to DIY Day at A Soft Place To Land! The Pear Cake looks delicious! I have some pears in my fridge right now. Think I might try making it tomorrow...thanks for your most lovely giveaway! Hope things are well with you...I will by each day this week for sure! I don't think I've ever made a dessert with pears! That does sound pretty yummy though. With that said I probably won't be having a link to share TODAY! But wait till tomorrow!!!! Big Oh boy I love me a good candle to burn and I hope I win size hugs to you! I don't know if I've ever baked with pears, but that dessert looks wonderful! That looks so yummy. I'll have to dig up a pear recipe...and come back. This looks really good! What could be better than pears and cream cheese. I'm going to try it for sure. Pears bring back alot of memories. When I was a kid we had a pear tree in our back yard and I can remember helping my Dad pick them. We would take them in the house and my Mom would make pear tarts or cobbler. I loved the pear tarts. Haven' had either in about thirty years. The squirrels finally took over the tree and it eventually got cut down. I love pears! We had 3 pear trees in our yard when I was growing up. 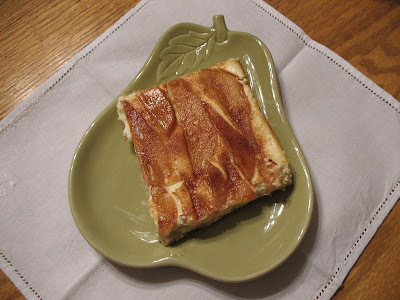 We made pear relish and canned pears every year and the pear cobbler was wonderful! That looks very very yummy! I will have to try it. I think I have a pear dessert somewhere...going to find it. That dessert looks so yummy, Lisa! I can't wait to try it. Oh my gosh! I'm going to the store NOW to buy pears. That dessert looks DEEEVINE! I love baking with pears ... I swap them out with apples all the time. Can't wait to collect some new recipes this week! 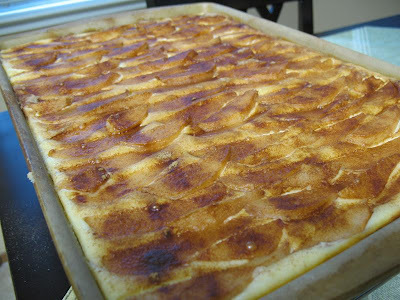 Not only does this pear recipe sound delish, it looks so beautiful. I can't wait to see the rest of your fruit recipes that you post this week. Here's to celebrating great fruit and God's wonderful bounty. Oh pears! We had a pear tree at our old house and I really miss it so much. I'm excited to have found your blog and look forward to all the great recipes. And I love that you declared chocolate a fruit. It plays so nicely with fruits that it might as well be one! Just came upon your blog through Like A Warm Cup Of Coffee! This is going to be fun! Thanks for the great pear recipe! Great festival, recipes, and giveaway! What great timing! Oh how I love pears! Great recipes! It looks so lovely! We happen to have some pears and I can't wait to try this. Thank you! I love your fall fruits festival idea! I will be sure to check back to see what you have in store. And great giveaway! Well, this will be really neat because I don't think I have ANY pear recipes!! For some reason I've just never cooked with pears like I have with apples. I'll look forward to trying your recipe! Thanks for the festival. What a yummy idea! Can't wait to try it. Thanks for the fun this week! The pear cake looks yummy! My husband's favorite is pear preserves which I've already made for him this year. Thanks for the neat giveaway! My stars! I have never seen pears look so delicious!! I love pears! I cannot wait to try this recipe. Thanks! I love your fall festival theme, excellent!! Great fun and a giveaway! I am hosting a pumpkin roundup next monday and would love for you to link up. Darn! I thought I was linked! Better late than never?? Nevertheless, I adore pears and loved my pear pie this weekend. Hi Lisa...I got a kick out of your pear post...cuz I just did one on MOnday. You should check it out. I didn't know you were having a McLinky! The name of your blog is perfect....that about sums up my life...and my hips! Wow, I have had this before and yes, it is great. I just don't think there would be ANY left to share if I made it for my family. :) Looking forward to the rest of this blogging week. I love this time of year and so glad I found you. I can't wait to try such an awesome recipe! Do I have to share? I don't usually cook anything with pears. I'll have to try your pear dessert--but after I try a bunch of pumpkin recipes! I think I shall make this for the next fellowship meal at church. Pears have quickly become a fall favorite at our home. Will also try it Gluten Free for the hubby and son. Thanks! I've never baked with pears...looks yummy! I've never cooked with pears. This looks absolutely delicious. Would probably be good with apples too. I bet the kitchen smells wonderful with this in the oven and that candle burning too. Aroma heaven. I was recently given some pears from my dil's grandfather's farm in Nebraska and was looking for recipes when I found your great blog! I've already bookmarked several of your recipes. I'll be back! !